You’re special, and your dedication deserves the best tool that swimming can offer – Avidasports™ – because you’re worth it! This is the most high-tech invention to ever hit the swimming world, resulting in swimmers taking ownership of their results like never before. If you want to be on the cutting edge join the Avidasports™ Revolution! What if you improved 3% this season? Check this out – what would your 50 free time be after a 3% improvement? Get the most out of your training – your time is valuable – and each lap matters. Check out how this swimmer has benefited. 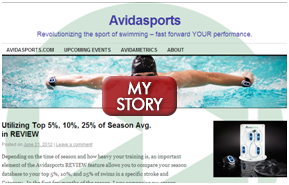 Continue the exciting improvement with Avidasports™! Get the greatest benefit you can from using Avidasports™, be sure to visit this page often to add new videos and tips to your competitive advantage! 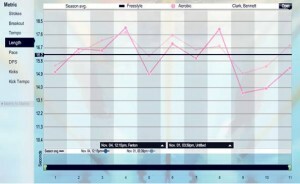 Bennett Clark, Cal Berkeley post-grad, has produced two videos on how he reviews his Avidasports™ data. This swimmer is comparing his split times from a test set he swam on two different days. 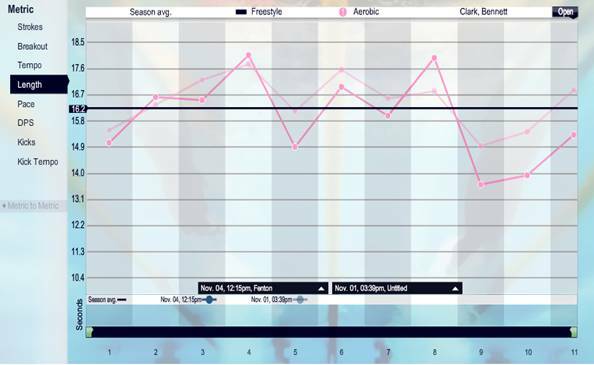 The bold pink line shows he performed faster the second time completing the set, he’s improving and has proof of it. What do you think is most challenging? Give us your feedback, send us an email. We’d love to hear from you!